Graham Boyd was pivotal in Bond's Glen play-off victory. The curtain fell on the North West cricket season on Sunday when, thanks to the patience of both teams, the two umpires and host club Ardmore, the Championship play-off was concluded right on schedule. Bond’s Glen had finished the domestic season at the bottom of the second tier while Sion qualified for their shot at promotion by posting a second-place finish in Qualifying 1, but it was to be the ‘Bee Gees’ who held their nerve in the finale. Willie Jackson made a hard hitting 40 at the top of the order to get Bond’s Glen off to a steady start before a couple of rain interruptions saw the game reduced to 34 overs a side. 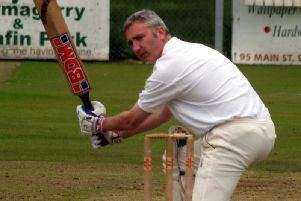 However the real damage came in a 132-run stand between former skipper Graham Boyd (76) and new skipper Trevor Britton (69 not out) as the innings closed on a hefty looking 230-4. Craig Alexander (2-27) was the most successful of the bowlers but Lee Finlay fared well without much luck. The latter however really gave his team hope with the bat as his half century kept Sion within touching distance. It was to be in vain however as a couple of wickets a-piece for Kyle Moore, Derek Curry and skipper Britton saw the Mill side all out for 155- a 75-run defeat. Congratulations then to the ‘Bee Gees’ who survived a very testing season and are likely to be the better for it next year. Sion can hold their heads high however and they certainly weren’t out of their depth in the play-off. There is plenty there to work with as they now re-group for another assault at promotion.